Original Editors - Brian Blevins and Allison Lesousky from Bellarmine University's Pathophysiology of Complex Patient Problems project. Postural Orthostatic Tachycardia Syndrome (POTS ) is described by a patient's intolerance to the change of body position from supine to upright position. Characterized by a dramatic and excessive increase in heart rate along with an abnormal drop in systolic and diastolic blood pressure. POTS is theorized to be due to an autonomic dysregulation regulating blood flow and more specifically its' responsibilty to control cerebral blood flow. POTS be classified as; primary or idiopathic with no known cause; secondary, which arises from a known disease or disorder. The prevalence of POTS is currently unknown, with it currently estimated to be about 5-10 times as common as orthostatic hypotension in clinical practice. Some studies have indicated estimates as much as 170/100,000, but also based on the estimate that 40% of chronic fatigue patients have POTS. Patients being evaluated for the presence of POTS are most commonly between the ages of 15 and 50. Most common presentation is characterized with orthostatic symptoms consistent with reduced cerebral blood flow due to a lack of sympathetic stimulation of the cardiovascular system to adapt to the change in position. Lightheadedness, heart palpitations, presyncope, syncope, tremulousness, and weakness or heaviness in extremeties (particularly lower extremities). All symptoms are typically exacerbated by heat or exercise, with chest pain and shortness of breath are also common. Patients further present with non-orthostatic symptoms such as nausea & vomiting, bloating, diarrhea, constipation, bladder symptoms, hyperhidrosis, and loss of sweating as well. POTS will also have diffuse systemic affects such as fatigue, thus POTS being associated with Chronic Fatigue Syndrome, as well as sleep disturbances, migraine headaches, disorientation, visual disturbances and in rare cases patients may even present with neuropathic pain. Heart rate variations commonly is sinus tachycardia, but bradycardia has been known to present, and with continued standing blueness, swelling, and venous distention very commonly present . Females tend to be more susceptible to POTS with an estimated female:male ratio of 5:1 . POTS symptoms tend to have a marked cyclical nature, with females having noticeable deterioation of their symptoms at certain stages of their menstrual cycle with significant weight and fluid changes . Some have cycles of intense orthostatic intolerance, subsequently followed by periods of symptoms improvement. POTS is primarily idiopathic, but secondary POTS is characterized by the presence of a disease or disorder. The most common associated co-morbity that presents with POTS is Chronic Fatigue Syndrome (CFS). Currently it is thought that POTS may cause CFS with patients demonstrating orthostatic intolerance and the treatment of POTS usually improves the disabling fatigue in patients with both POTS and CFS. Other associated co-morbidities are found to include, vasovagal syncope, or specifically named "neurocardiogenic syncope" characterized by similar symptoms such as syncope upon position change and autonomic dysregulationPOTS has been also associated with patients with fibromyalgia due to the improvement in myofascial and neuropathic pain symptoms when treated for POTS. Irritable Bowel Syndrome often associated with POTS due to the presence of the related autonomic dysfunction. It has also been proposed that Ehlers-Danlos Syndrome (EDS), a connective tissue disorder, is found in some POTS patients . This syndrome tends to occur with POTS due to the abnormal connective tissue development in dependent blood vessels which allow excessive amounts of blood to pool in the lower limbs when they stand. Currently, POTS is difficult to diagnose and patients usually endure symptoms for a year or longer. However, once all other differentials are excluded, patients are often diagnosed with POTS through a tilt table test. A patient is strapped to a mechanical tilt table in which it will tilt them upright at angles of at least 60 degressMeasurements of HR and BP are taken in supine and then at intervals during the change in position and this test can take up to 40 minutes or until the patient faintsOften the tilt table test is used concurrently with a transcranial doppler ultrasonography which proves useful in determining cerebral blood flow perfusion during position changes. It is very important to rule out all differentials that could indicate a more serious systemic pathology such as Addison's, Lyme Disease, thyroid dysfunction, etc. The current etiology of POTS are not fully known. POTS is theorized to be due to an autonomic dysregulation regulating blood flow and more specifically its' responsibilty to control cerebral blood flow. Many patients will develop POTS in their teens after periods of rapid growth, especially in males, and will see symptom improvements as age advances. Other patients will develop POTS after a significant viral or bacterial infections such as pneumonia, or even after trauma such as an MVA. Women also tend to develop symptoms of POTS after pregnancy, in which prognosis for symptoms tend to be less optimistic. POTS is primarily idiopathic, but secondary POTS is characterized by the presence of a disease or disorder. The most common associated co-morbity that presents with POTS is Chronic Fatigue Syndrome (CFS). Currently it is thought that POTS may cause CFS with patients demonstrating orthostatic intolerance and the treatment of POTS usually improves the disabling fatigue in patients with both POTS and CFS. Vasovagal syncope, or specifically named "neurocardiogenic syncope"
It has also been proposed that Ehlers-Danlos Syndrome (EDS), a connective tissue disorder, is found in some POTS patients .This syndrome tends to occur with POTS due to the abnormal connective tissue development in dependent blood vessels which allow excessive amounts of blood to pool in the lower limbs when they stand. POTS can have significant systemic involvement given all other differentials are excluded. Systemic involvement usually involves hypo-perfusion of blood to upper body, and in particular the organs. This includes symptoms presenting related to reduced cerebral blood flow such as decreased mental stamina, depression, difficulty finding the right word, impaired concentration, sleep disorders. 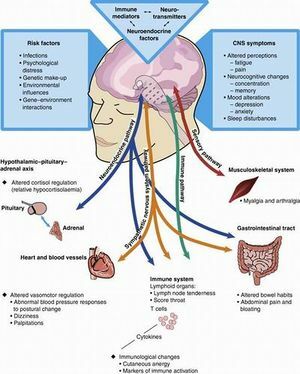 Symptoms can also present as hypo-perfusion to viscera and/or related to autonomic dysregulation such as abdominal pain or discomfort, bloating, constipation, diarrhea, nausea & vomiting . Other systemic involvement usually related to chronic fatigue and general malaise, thus the common co-diagnosis of Chronic Fatigue Syndrome. Patients are encouraged to manage their symptoms through diet, including a high fluid intake (2L/day) and at least 3-5 g of salt. Acute blood volume expansion has been shown to be effective at controlling the heart rate and acutely improving symptoms. Jacob et al. found that 1L of physiological saline infused intravenously over 1 hour decreased the orthostatic tachycardia immediately following the infusion. If non pharmacological treatments are not successful medications may be trialled. There are no specific types of drugs treatments for POTS because it primarily depends on the type of etiology responsible for the syndrome. Drugs that have been shown to produce some success include: fludrocortisone, β-blockers, selective serotonin reuptake inhibitors (SSRIs), and norepinephrine reuptake inhibitor (NRI). Fludrocortisone helps by increasing the sodium and fluid retention, while also sensitizing α-adrenergic receptors. SSRIs increase nerve stimulation and communication of the standing vasoconstriction reflex, which reduces the venous blood pooling and in turn increased the patient’s orthostatic tolerance. In symptomatic patients, the addition of a NRI would also be beneficial. A multi-disciplinary approach is required as the patient’s activities of daily living become increasingly more difficult and require help in all aspects. It is essential to involve the knowledge of occupational/physical therapists, social workers, and clinical psychologists as well as legal counsellors. All patients, no matter what their underlying condition causing POTS is, should be encouraged to begin a reconditioning program of increasing to at least 20-30 minutes of aerobic activity three times a week, if they can tolerate it. Resistance exercises of the lower extremities is promoted to enhance the effectiveness of the skeletal muscle pumps eg leg press. Physiotherapy after large meals should be avoided as blood will be diverted to gut, further lowering BP. The following videoclip shows a young womens journey of 15 years living with POTS and her symptoms and treatment approach. ↑ 2.0 2.1 2.2 2.3 2.4 Phillip A. Low, M.D. ; Paola Sandroni, M.D., Ph.D.; Michael Joyner, M.D. ; Win-Kuang Shen, M.D. Posted: 08/11/2009; J Cardiovasc Electrophysiol. 2009;20(3):352-358. ↑ Streeten DHP: Orthostatic Disorders of the Circulation, Mechanisms,Manifestations and Treatment. New York: Plenum Press, 1987. 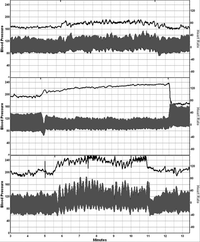 ↑ 4.0 4.1 4.2 4.3 4.4 4.5 Agarwal A, Garg R, Ritch A, Sarkar P. Postural orthostatic tachycardia syndrome. Postgrad Med J. 2007 Mar 20;83:478-480. ↑ Wallman D, Weinberg J, Hohler AD. Ehlers–Danlos syndrome and postural tachycardia syndrome: a relationship study. Journal of the neurological sciences. 2014 May 15;340(1-2):99-102. ↑ 6.0 6.1 Grubb, Blair P.; Kosinski, Daniel J.; Boehm, Kathy; Kip, Katrinka (1997). "The Postural Orthostatic Tachycardia Syndrome: A Neurocardiogenic Variant Identified During Head-Up Tilt Table Testing". Pacing and Clinical Electrophysiology 20 (9): 2205–12. ↑ Raj S. The postural tachycardia syndrome (POTS): pathophysiology, diagnosis and management. IPEJ. 2006;6(2):84-99.